This is a secondary web site for the Mars work being done at the UW. It represents a fraction of Harvey Greenberg's work. This information is not necessarily complete, current, peer-reviewed, or intelligible. 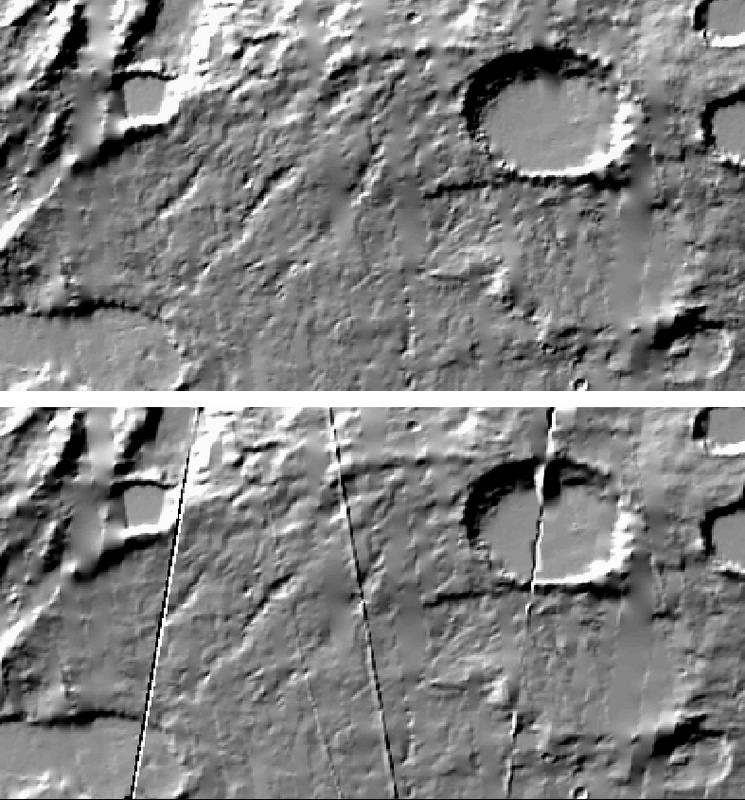 These 2 sets of 3 images show the DEM for bahr. The set on the left covers the whole watershed, whilst those on the right are zoomed in. The top images are the NASA 1/128th-degree DEM. 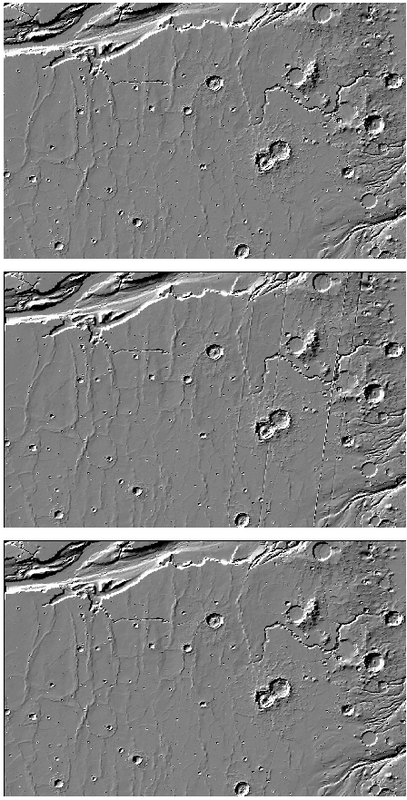 The middle images are the DEM created with the NCAR natural-neighbor algorithm, and the bottom images are the same, but with some misaligned tracks filtered out. These are similar images for Warren. The top is NASA, and the bottom is NCAR. I did not bother to make a third image with firltered tracks. It would seem that, contrary to our expectations, the PEDR data does not reflect cross-track correllation. This is supported by the discovery of pairs of records with the exact (to five places, approximately 60 cm precision) X and Y coordinates, and Z differences of 10.7 and 4.6 meters. Thus we see that 1) the NCAR algorithm does look much better. and 2) we don't seem to have the correct XYZ data to feed to the program. Hebe's Chasma is up to 8100 meters below the level over which water would flow out. 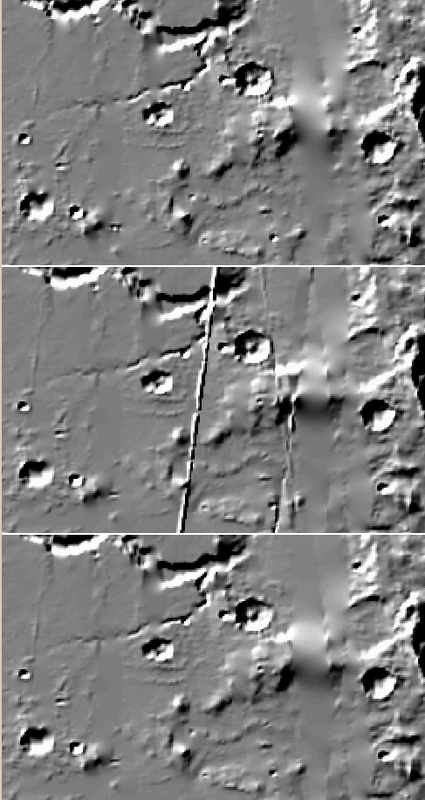 A centerline (green line above) was hand-drawn through Valles Marinaris. 112 cross sections were run from this line. On each cross section, the lowest elevation within one degreee (60 km) of the green line were selected. These points were connected to form the red line. This line could use some cleaning up. It's not clear was it proves, but it hints that the topography varies substantially from a terrestrial fluvial system. The elevations of the red line are shown below. Of that volume, 387136 cubic kilometers (~7%) lies in apparently undrained sinks.